This year the Great Big Egg Hunt, run by The Egg Theatre in Bath, is returning for another year this Easter. 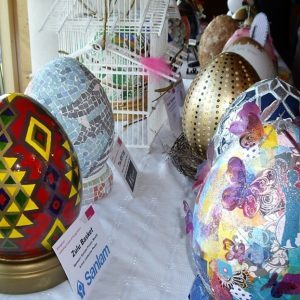 The hunt involves many local businesses signing up to collaborate with local primary schools to create and design approximately 40cm high eggs for hunters to seek out around Bath and be in with a chance of winning some fabulous prizes! 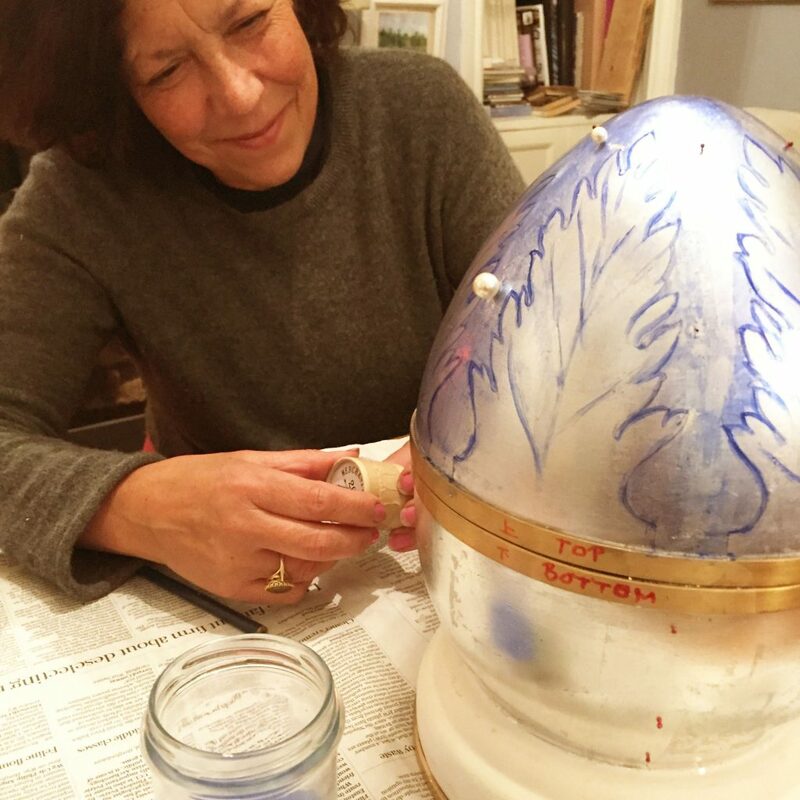 We at Nicholas Wylde are lucky enough to be friends with the incredible Jane Knapp, a Bath based Artist and Lighting Designer, who seemed the obvious choice for a collaboration when we decided we’d cut our egg in half to make a giant Faberge egg! To design it’s interior we chose Widcombe Junior School’s art club – a small class of wonderfully creative children who designed a fantastic array of inspiring mood-boards, the winning design of which will be proudly displayed within our egg at our Bath store this April. The class were very excited to be approached, and following the design’s winner being chosen, the whole class will be heading to The Egg Theatre for a free show! We found out later that Jane Knapp herself attended the same school – a happy coincidence which marvellously tied our design origins together. 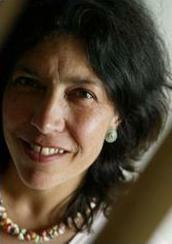 We sat down with Jane to learn more about how she become creative genius she is today! After primary school “when the headmaster wore a black gown” Knapp had then attended The Bath Art Secondary School – “where visual thinking was encouraged. I also went to Bath Academy of Art for evening classes in life drawing as a teenager before enrolling as a full time student when I was older.” Knapp eventually went on to lend her creative talents to a fantastic selection of projects [pictured below]. “I have worked in the world of theatre behind the scenes as a scenery painter and prop maker. 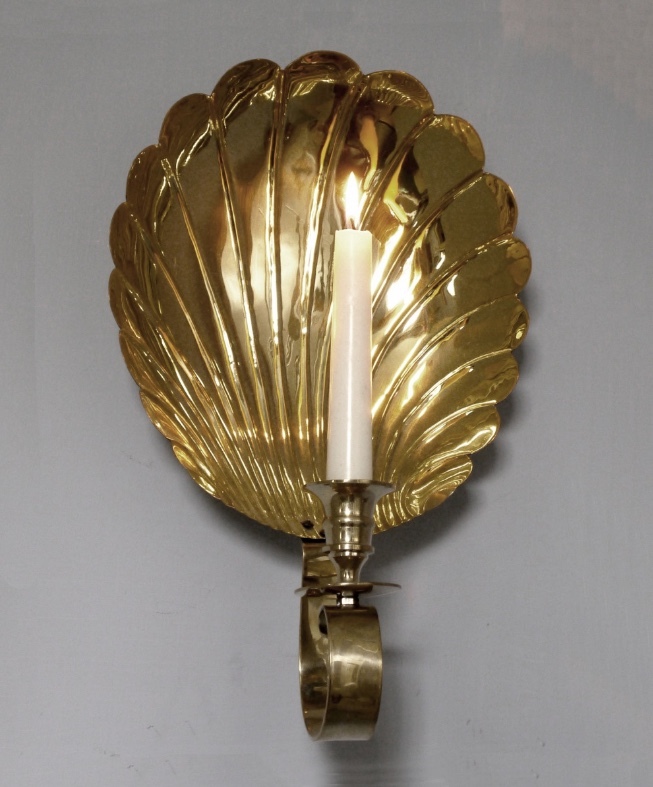 For many years I was Design Director at Walcot Reclamation which was started by my husband Rick and I became immersed in the world of period details, interior design and antiques. I continue to work as a freelance mural and special effects painter for residential projects, museums, churches and large country houses, and in concert with my painting work, I have designed and I sell my own brand of handmade lighting“. 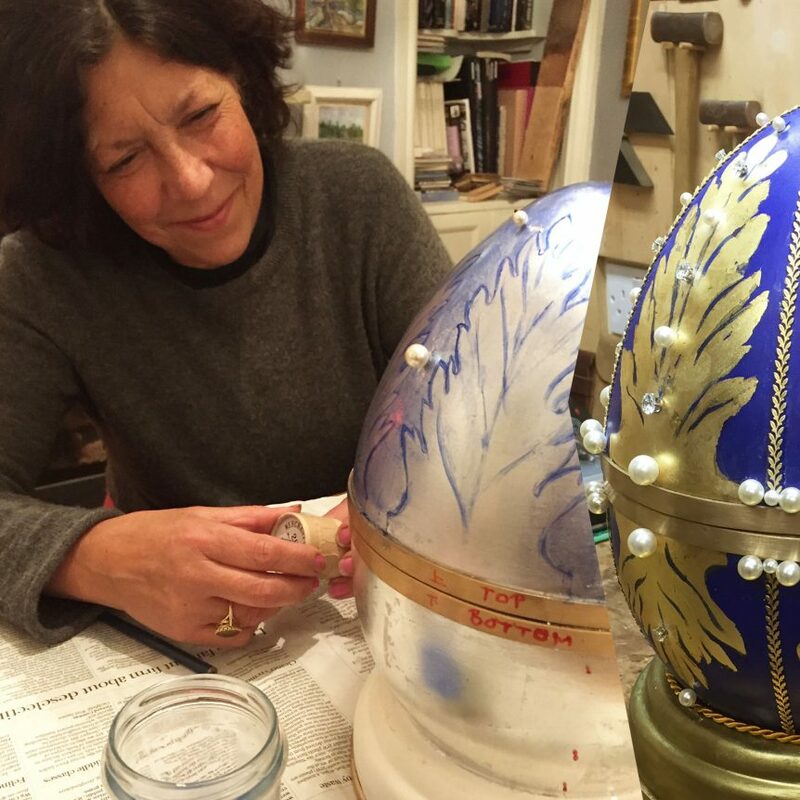 As you might imagine, we were thrilled to have her accept our collaboration to help design, paint and construct our oversized Faberge style egg. Fingers crossed it’s the only one in the egg hunt! We asked her how Nicholas approached her about the egg – “His brief was to combine the company colours and be inspired by the opulence of Faberge eggs. I knew that the egg would be part of a window display in Northumberland Place and would be studded with gems”. Nicholas himself set the stones, drilling holes for the claw settings and pearls that would sit the shell’s design. He also handmade the structured interior and the brass frame at the Bath based Wylde workshop. The piece took over a month of work for Jane and Nicholas, and involved multiple stages of development to construct. Jane says she greatly enjoyed the process, seeing her hard work preparing the egg, stencil cutting and all her painting come to fruition; commenting that “creative projects are my rocket fuel”! You can shop some of Jane Knapp’s beautiful creations here (we particularly love her candle sconces), as well as learn more about how you can hire her to paint you a mural or marble a fireplace! We know we would certainly recommend her! The full finished, open egg, with our wonderful Widcombe student’s fabulous design inside, will be revealed at the start of The Great Big Egg Hunt. Find out how you can get involved with the Egg Hunt here – It’s sure to be fantastic fun!